Summary: Sungmin and Kyuhyun accept the challenge of seducing each other to decide who is the most sought out guy at their insurance company, they decide to date each other, the one that falls in love first loses. Youngwoon is Sungmin's childhood friend and has been in love with him for a long time already, yet had never had the nerves to confess. Upon seeing Sungmin going to the arms of another male, Youngwoon asks Sungmin to promise to keep his Mondays to 'best friends time' and Sungmin agrees. Sungmin's Mondays become Youngwoon's, but would one day be enough to express his feelings when Kyuhyun has the rest of the week? Disclaimer: I am in no way associated with SM Entertainment or Super Junior. This is all just for fun. Summary: That's the thing about life, though - just when you think you have it all figured out, or when you think all doors have been closed and all opportunities are lost, it throws you a curve ball and shows you nothing is impossible. Now they're two halves of a whole, or however the cliché might go, and Kangin can feel that he's missing a part of himself. "Thanks for the coffee anyway. The effort is what counts"
"I'm not angsting." Kangin argues. "I'm venting." Summary: Being the Lord Protector means keeping Sungmin, the young Emperor, safe from anyone who would seek to harm him, but Youngwoon never expected that he would also have to protect Sungmin from those who claim to be the most loyal. Things become even more complicated when their friendship slowly turns into something more romantic. With Sungmin trying his best to rule an empire while keeping scheming senators at bay, Youngwoon can't let them cross that tempting line since Youngwoon knows all too well that his feelings will only be used to harm the very person he is trying to save. A trembling has taken root deep within Youngwoon's bones which he cannot solely blame on the quaking of aged stone. Summary: Sungmin made a promise when he was a child that he would think for a thousand days about a certain spirit raccoon called Youngwoon, but childhood promises are hard to keep when there's an ocean between the two. Warnings: Supernatural AU Vampire and Werewolf ideas were based on RPGs from White Wolf Publishing house with a few adaptation ^^'. Summary: Every relationship has its up and downs, the first time Sungmin and Youngwoon's relationship was put through fire was the time the human was facing a silent and inevitable transformation. Sungmin's side of the story. Summary: Every relationship has its up and downs, the first time Sungmin and Youngwoon's relationship was put through fire was the time the human was facing a silent and inevitable transformation. Youngwoon's side of the story. Summary: Knowledge is power. Sungmin learned that a little bit too late. Summary: Sungmin was glad he finally got his divorse, he was elated his laywer was more than willing to not allow him to remain single. Summary: A mindless routine can turn into a very very special one if only people are open for the changes. Summary: He wants to take that terror and mold it into something tangible. Youngwoon desires to see this human trembling in trepidation. He wants to see Sungmin bend under the pressures of that fear; to come so close to breaking, but then stand defiant against it because someone like Sungmin should never submit. It's perhaps to be expected of Youngwoon; of course he would develop a fascination for someone he cannot have. A/N: Sorry for the long (veeeeeeeery long) delay. This fic is complete now so I promise to update!! Follow this link to find part 1 of the first story arc "Winged"
Follow this link to find part 1 of "Winged II - The Ascension"
Sungmin’s features didn’t change at all, maybe he seemed more mature but still had the same joyous face he had fallen in love with. Seven years ago. Before Sungmin died." Summary: Peaceful moments can suddenly turn into war. When you get used to it, surprises can still happen and your piece of the world can get a new color and at the same time become a little bit more colorless. Disclaimer: I'm in no way associated with SM Entertainment or Super Junior. No profit, just fun! Summary: Sungmin gets back from China after a month and shameless pwp happens. 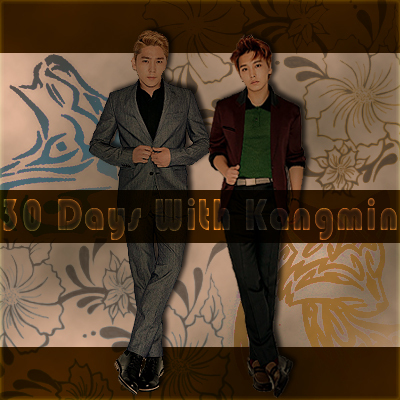 dom(ish)!Sungmin and sub(ish)!Kangin. Disclaimer: I'm in no way associated with SM Entertainment or Super Junior. No profit, just for fun! Summary: KangMin unrequited love in Waikiki. Author's Note: I hope everyone is having a glorious summer (or winter, you Southern folks)! I asked a friend for one word to get my creative juices flowing and she just screamed 'whale calls!' which was two words, but I let it slide and this angsty little number shot out. I hope you enjoy! Summary: Every relationship has a start. This is how Youngwoon fell in love with a vampire called Lee Sungmin. Warnings: College AU and this is fiction of course. Summary: Sungmin is a guitarist, composer and lyrist for his rock band, Youngwoon is a barista and patisserie who dreams to be a musical actor, Jongwoon is Korea's dearest balladeer 'Yesung' whose hobby is to help talents reach their dreams, Kyuhyun is a college student working part time in a very unusual place, who happens to have eagle eyes to certain things. Books & Cupcakes is the place where all of them met and were tangled in lyrics that talked about loyalty, friendship and love. Coupled with the guilt, the desire to eventually fix things, there was just no way he would ever truly be able to move on.